Xavier Desaulles, CEO of Club Med, East and South Asia & Pacific said: "This research is a timely insight into the mind of today's Asia Pacific consumers who enjoy a snow holiday. The market is evolving rapidly in line with Asia's growing affluence and interest can only grow fuelled by back-to-back Winter Olympics in PyeongChang and Beijing." "This survey is an essential new tool that will allow us to inform and service our clients and regional partners as we understand how their habits and needs are developing and as we open new mountain resorts regionally and globally," he added. 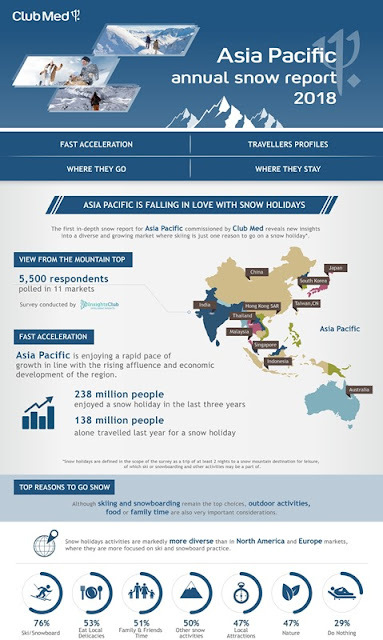 The snow holiday market has seen rapid growth in Asia Pacific in the last three years with an estimated universe of 238 million travellers including 138 million alone in the last 12 months. The numbers correlate with the region's growing affluence and desire to explore the world in a more experiential and different way whether with family or friends. Currently snow holidays, remain the preserve of the new affluent class and above. 85% of Asian snow holiday goers enjoy a household income of USD 4,000 or more -- significantly higher than the comparable general Asia Pacific population at 33%. The surprise came from Switzerland, ranking third regionally and first amongst long haul destinations. For Indian snow enthusiasts, Switzerland was the most popular destination, partly fuelled by the prominence of the country in its Bollywood movie scene. 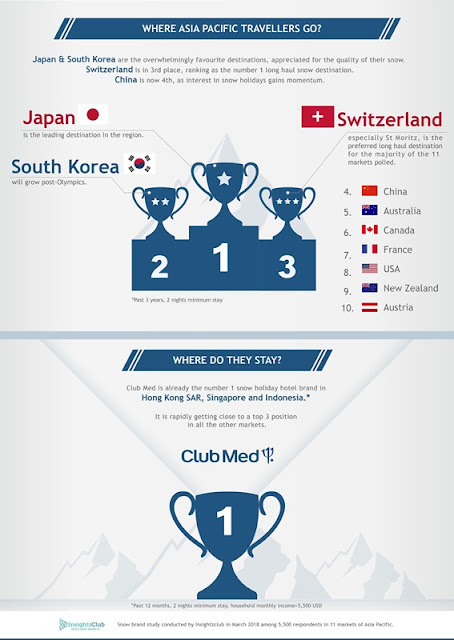 St Moritz in Switzerland was the top long haul destination for Asians looking for a snow getaway. In Europe, Club Med has17 snow resorts including one nestled on the globally-renowned and Asia's favourite slopes of St Moritz. Club Med plans to open one new mountain resort in the Alps every year. It will also be back in North America with the opening of a resort in Charlevoix, Quebec, Canada in 2020-21. Club Med is the worldwide leader in upscale Premium All-Inclusive holidays. Guests have the freedom to enjoy the wide variety of services and activities that our Resorts offer, be it on their own or with others. The extraordinary Club Med experience includes accommodation with refined comfort, all gourmet meals, all-day bar and snacking, ski passes and snow sports with lessons, night entertainment and parties, as well as children's clubs for all ages. Guests get to enjoy true quality time with their loved ones knowing that everything is safe and taken care of. Club Med offers them the chance to discover amazing moments together, as well as become amazing themselves. With around 70 resorts located all over the world, 21 being ski resorts, vacationers may look forward to spending a truly amazing holiday at exotic locations! I could use a snow holiday! It's good to know about winter in Japan as we're planning to go there in January and we don't know what to do. Hokkaido maybe a better place for skiing than in NZ where we went last July. Well written post! Snow holiday is on my wish list! What great info for those wanting a snow holiday! sounds amazing. I'd love to have a snow holiday. I yet have to learn how to ski, but I'd love to try skiing some day. Sounds like a fun place to take a holiday at. Have a great week. That would be an amazing place to check out. Snowboarding wearing a kimono! Wow! I rarely travel in the winter, but it's maybe good time to change it.